"Greetings from Cameroon. I am glad to inform you that with support from the Rotary Club of Down town Lacrosse Wisconsin and Rotary Foundation the Cameroon Education Foundation is currently constructing 60 toilets and 20 washhands facilities in 10 rural schools in Caneroon. The Lacrosse Club and Books for Africa have equally funded two 40-foot containers of books which have just arrived Cameroon as I write. Please note that this club, with Caledonia Club, are sponsoring the training of librarians and PTAs. So far since I left the Humphrey School and addition to the above recently donated containers we have imported a total of ten containers of books to Cameroon to improve literacy. I will equally be guest speaker in the upcoming World Literacy conference in Oxford UK in March 2018." 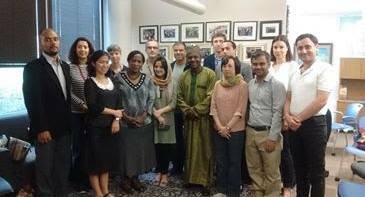 Mr. Idriss pictured here with 2015-16 Humphrey International Fellows during his September 2015 visit to the Humphrey School. Mr. Idriss' bio from 2010-11 Fellowship year: Over the past 17 years, Mr. Idirisu Chin has held many leadership positions within Islamic education in Cameroon, first as vice principal then principal of an Islamic high school, and now as chief of pedagogy and administration for the Organization of Islamic Educational Establishments in Kumbo, North West Region. The organization plays a vital role in promoting Western education in Muslim communities in Cameroon. He is in charge of personnel issues, including recruitment, training, promotion, salaries, separation, and retirement. Mr. Chin has served 15 years on the Cameroon Anglo-Saxon Examination Board, and serves as coordinator of the Fight Against Corruption through Schools (FACTS) Project for Islamic education for the North West and South West regions of Cameroon. He received a Bachelor of Arts in history from the University of Yaounde, Cameroon.